When selecting the plant species to use in a forage system, consider a combination of yield, quality, and persistence characteristics of the forage. We think of tall fescue as being very productive and persistent, but of lower quality, and of bluegrass as being persistent and of high quality, but low-yield. Ryegrass and orchard grass-legume mixes are very productive and high-quality, but may not be persistent under lax management or harsh environmental conditions. Thus, we must recognize the strengths and weaknesses of each forage species and combine them to achieve a balanced productive pasture. Check with successful graziers in your area to determine appropriate mixes for your locale. An easy-to-use forage identification and selection system, and other forage management information, can be found at Oregon State University's Forage Information System website. Another practice that contributes to cattle health and performance is a diverse pasture planting called an "herbal ley." If you are farming on land with good fertility that is not drought-prone or seasonally water-logged, then a good general purpose "herbal ley mix" might be a mixture of: perennial ryegrass varieties suited to your soil type and situation; a range of white clover types plus other legumes, like red clover and greater bird's-foot trefoil; plantain (ribgrass) and, perhaps, chicory; and additional grass species suited to the site, like orchard grass on lighter land or timothy on heavier land. Herbal leys are especially suited for dairy farmers interested in high quality grazing or silage production. It can be adapted for use on good quality beef- and sheep land by using some of the smaller-leaved white clover types which are more persistent and tolerant of closer grazing. Other herbs can be added to this basic mix, but they may not persist long in the vigorous sward. Persistent perennial "weeds" like dandelion and dock (sorrel) should not be eliminated from these established swards; they are relished by stock and contribute to stock health and nutrition. More background on using and managing an herbal ley can found in Fertility Farming (Turner 1951). Grazing cows. Photo credit: Amanda Gervais, University of Vermont. Pasture renovation is usually done to control weeds and/or undesirable grass species. Growing an annual crop such as oats or annual ryegrass will help provide a general cleanup of the pasture before reseeding. When you reseed a pasture, a fine, firm seedbed is essential. Use a roller after cultivation and seeding. Broadcast seeds evenly over the ground. When you broadcast evenly, a seeding rate of 28 lb of perennial ryegrass per acre provides one seed per square inch. Do not drill seed in wide rows, which leave large areas—6–8 inches between rows—open for weed establishment. If you prefer drilling your pasture, drill lighter rates in two directions to fill open areas. High-producing varieties of perennial ryegrass or orchard grass combined with white or red clover can produce over 12,000 lb/acre of dry matter annually. Newer varieties of white clover and perennial ryegrass, like those developed in New Zealand, are well adapted to coastal and valley climates. Plan a well-balanced fertility program to meet the needs of your established or newly seeded pasture. For background information on soil fertility and it's management in organic production systems, see Nutrient Budget Basics for Organic Farming Systems, Nutrient Management Plans and Fit with Organic Systems Plan, Organic Soil Fertility, Soil Fertility in Organic Farming Systems: Much More than Plant Nutrition, and Soil Management for Better Fertility on Organic Dairy Farms. Nitrogen (N) is the most-limiting nutrient for pasture production. Adequate N supports forage growth or dry matter (DM) production. Nitrogen also affects protein content of the grass. Legumes are included in pasture mixes because, through their symbiotic association with nodule-forming Rhizobium bacteria, they fix N from the air and are high-quality forages. For the most part, N fixed by legumes isn't directly available to grass plants (small quantities can be transferred between plants through the hyphae of symbiotic mycorrhizal fungi connecting their root systems). To become available, most organic N in legume plant tissues must first be broken down to plant-available mineral forms by animal digestion or by decomposition in the soil. White clover has the ability to fix 125 pounds N/ac/yr from the atmosphere when soil temperatures are above 52°F. Soil temperatures below 52°F greatly reduce rhizobial bacteria's ability to fix atmospheric N and for soil biological activity to release mineral N from decomposing plant residues and soil organic matter for plant uptake. When soils warm above 52ºF, pasture growth rates increase sharply. If adequate N is available as ammonium or nitrate in the soil, grass plants will produce 8–25 pounds DM per acre per day at soil temperatures between 41°F and 50°F. Phase 2 plant growth with warm soils can be 80–100 pounds DM/ac/d. Lower soil temperatures early in the pasture season and pastures without legumes will require application of manure before turning cows onto pasture in the spring to significantly increase grass growth. Apply approved N sources (such as manure, compost, feather meal, or fish emulsion) in August or September, with adequate soil moisture, to correct late summer pasture shortages and promote fall grass growth. Apply about 30 lb N/ac/month (about 6,000 gallons of liquid manure) during the growing season to pastures without legumes to support continuous production. Monitor the grass in the pasture for symptoms of N deficiency—slow growth and yellowish color. New seedings or pastures cut for greenchop, silage, or hay may require N to keep the grass component of the pasture healthy. Analyze manure for nutrient concentration before application. Without an analysis, use 6 lb N/1,000 gallons for liquid manure from a tank and 4 lb N/1,000 gallons for liquid manure from a storage pond to estimate application rates. Apply 5,000 gal/ac of tank manure or 7,500 gal/ac of pond manure to provide 30 lb N/ac. 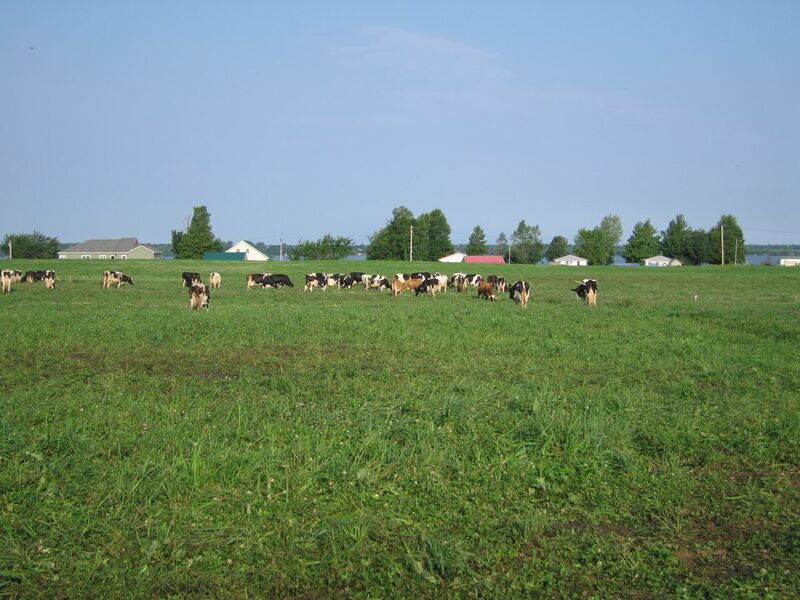 Potassium requirements are about 20% higher for harvested pastures than for grazed pastures. Use recommendations based on periodic soil tests to maintain the levels of phosphorus, calcium, magnesium, sulfur, and soil pH in pastures. Fall soil tests allow time to apply fertilizers and meet grass needs for the next grazing season. If in doubt about the status of any fertility input, check with your certification agency before purchasing or applying the product. See the article Can I Use This Input on My Organic Farm? for additional information. Forage Information System [Online]. Oregon State University. Available at: http://forages.oregonstate.edu/index.cfm (verified 19 March 2010). Turner, Newman (1951). Fertility Farming. Acres USA, Austin, TX. (Available for purchase at: http://www.acresusa.com/fertility-farming) (verified 12 March 2014).